Frogg Toggs’ Pilot stockingfoot breathable waders are made from guide quality, ultralight Supplex nylon shell material with exclusive DriPore C3 waterproof technology. They offer advanced, articulated spiral leg seams with reinforced 6-ply breathable knees, shins, and seat providing heavy duty protection while walking, kneeling, or sitting. Additional features include a quick-release safety wading belt with belt loops, and the “Quad Pocket” chest pocket design provides a fleece lined handwarmer pocket, an expandable fly box pocket, a zippered tippet and accessory pocket, and a zippered interior security pocket. There is also a chest draw cord for custom fit, and flat lying, adjustable “X Back” suspenders with quick-release buckles. The double-toed booties are 4-millimeter neoprene. Finally, the Pilot features “No-Sand” attached SpanDura gravel guards with integrated lace hooks. They come in sizes S through XXL in 2-tone Sage and Limestone. MSRP: $199.95. The “Sticky Rubber” Anura wading shoe features a durable mesh upper with a non-shrinking PVC-reinforced outskin. The upper is fully surrounded by a reinforced, rubberized base for added durability and protection. Other features include a comfortable neoprene tongue and padded mesh collar, a nylon heel pull, and a semi-cleat sticky rubber outsole. 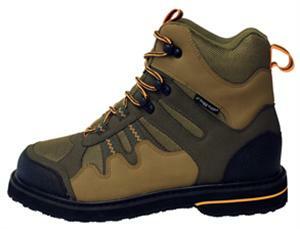 They’re available in sizes 7W through 13W in a 2-tone olive and camel color scheme with contrasting laces. MSRP: $79.95. The Anura reinforced stockingfoot breathable wader features an ultra-durable Supplex Nylon shell with exclusive DriPore C3 waterproof technology. The reinforced 6-ply knees and shins offer added durability while the 4-ply microfiber upper offers increased breathability. There is a custom chest pocket with an expandable fly box pocket, a zippered tippet pocket, and a zippered interior security pocket. Also included is Frogg Toggs’ comfort fit adjustable wading belt with belt loops and their “No-Sand” attached gravel guards with integrated lace hooks. The adjustable “X-Back” lay flat suspenders with quick release buckles and adjustable chest drawstring allow for a custom fit. The booties are constructed from Flex-fit 3.5-millimeter neoprene and are double taped for maximum protection. Available in sizes S through XXL in 2-tone sage and limestone for a MSRP of $159.95. The Hellbender stockingfoot breathable women’s wader features all of the best features of the Hellbender men’s wader with a custom cut silhouette designed specifically to fit the female angler. The comfort-fit women’s chest and arm cut was designed to eliminate bunching and gathering and cut to lay flat across the chest. Features include: a triple entry chest pocket, attached gravel guards with integrated lace hooks, double reinforced knees, zippered interior security pocket, and durable 3.5-millimeterm hi-density neoprene booties with double taped seams. Available in women’s sizes S through XL in a new Sage color for a MSRP of $129.95. Click here to find a Frogg Toggs dealer near you. More mentions of Frogg Toggs on MidCurrent. Montana Fly Company "Redneck Gator"